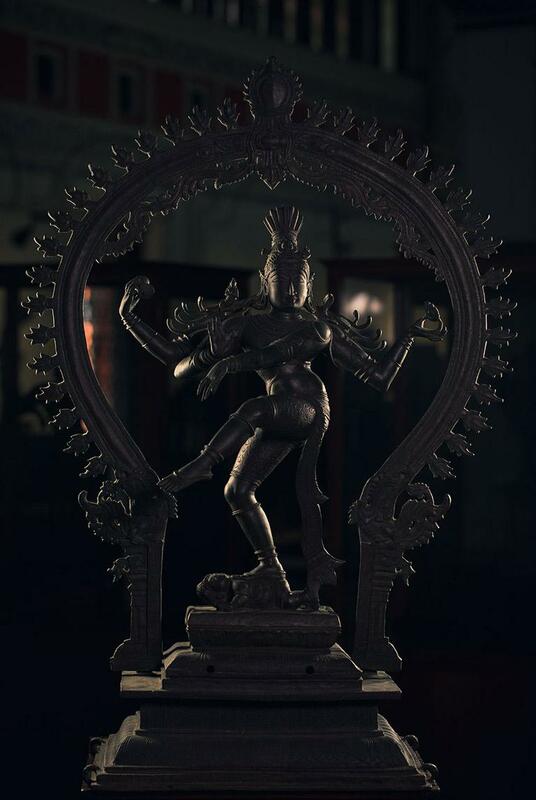 Nataraja "the Lord of Dance” is a representation of Lord Shiva. He is a cosmic ecstatic dancer. His dance is called Tandavam or Nadana, depending on the context of the dance. The figure has four arms. The jata contains Goddess Ganga, crescent moon etc. The back arms carry the drum and flame. The front hands are in abhaya and dancing gestures. It is said that creation arises from the drum, protection proceeds from the assuring hand and from the fire proceeds destruction. The left lower hand is bent round across the breast to the right with its fingers gracefully pointing below the left leg which is raised in a dancing posture. The position of this hand is known as gaja-hasta. The planted foot rests on the back of the dwarf Apasmara that represents the crushing of the demon. The appraised foot bestows salvation. The front left hand points to the lifted foot to indicate the refuge of the individual soul. The ecstatic and violent nature of the dance is described as ‘Ananthathandavam’.